I began with some guns, which I have labeled. As you can see, the RPK at the top has a round magazine, which is interesting aesthetically. I also like the in inverted looking grip on the middle grenade launcher. 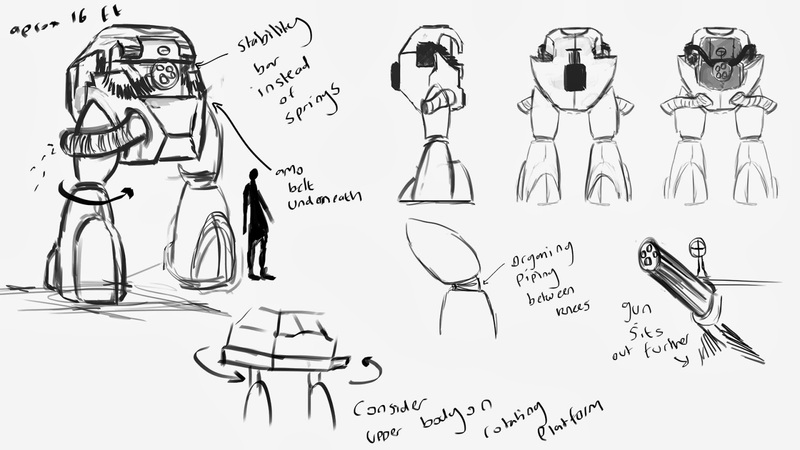 This is for the purpose of shock absorbance however, which our sturdy Mechs probably wouldn't need (They wouldn't really need any stock/ grip for that matter as the guns would be built in). The AK47, although interesting, is designed solely to be efficient for human use. It has a lot of hardware like switches and grips designed for human hands, which probably wouldn't be required for a mounted turret weapon on one of our machines. 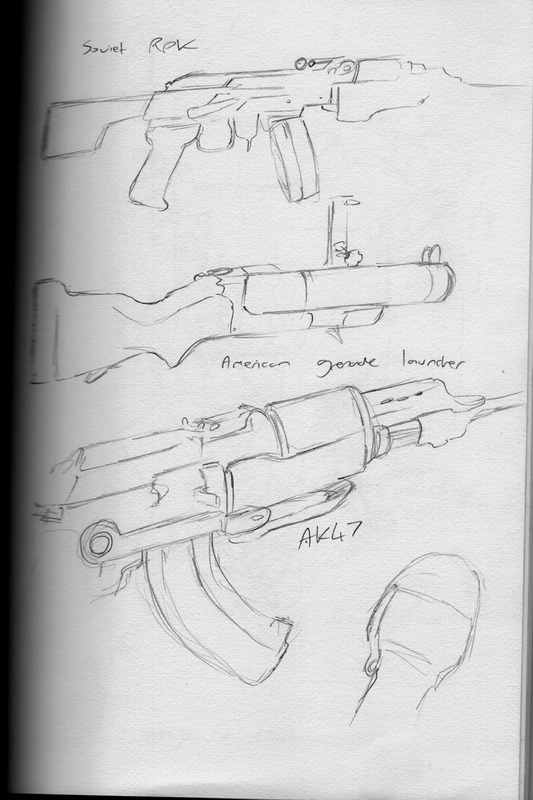 While sketching weapon parts, I had lots of discussions with Rhys who, is very informed when it comes to military hardware. One occurring feature we noticed, was the use of small springs to prevent recoil. This would be a possible requirement for a Mech, although with the weapon being bolted on to the machine, perhaps recoil wouldn't be as big of an issue, if at all. 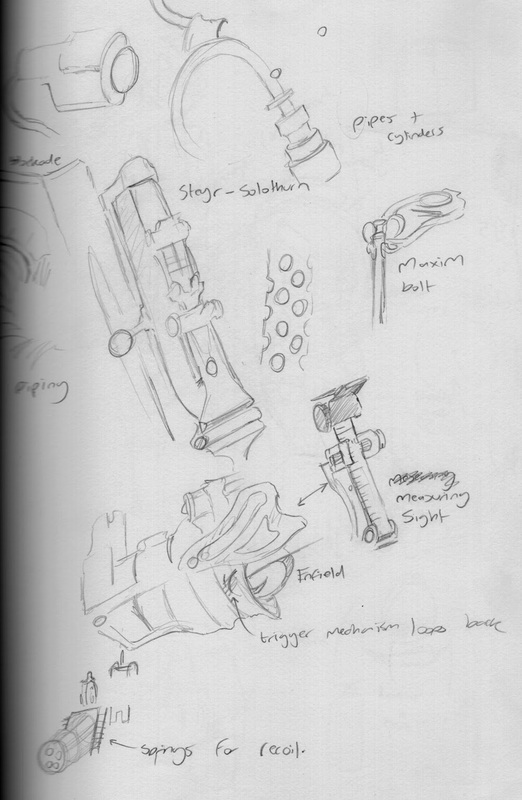 One thing which featured on the heavier weapons, was the use bolts and D-links. This is likely for deployability, another feature which might not be necessary on purpose built war machines, unless they have a changeable weapon system where different elements can be taken off and bolted on. Just a thought. On feature I did like, was the holed out barrel to the left of the 'maxim bolt.' I find the design visually interesting, although again this is a feature that aids recoil. Still, perhaps if the gun was bolted on there would be some need for recoil reduction. It was useful for me to sketch during the visit. 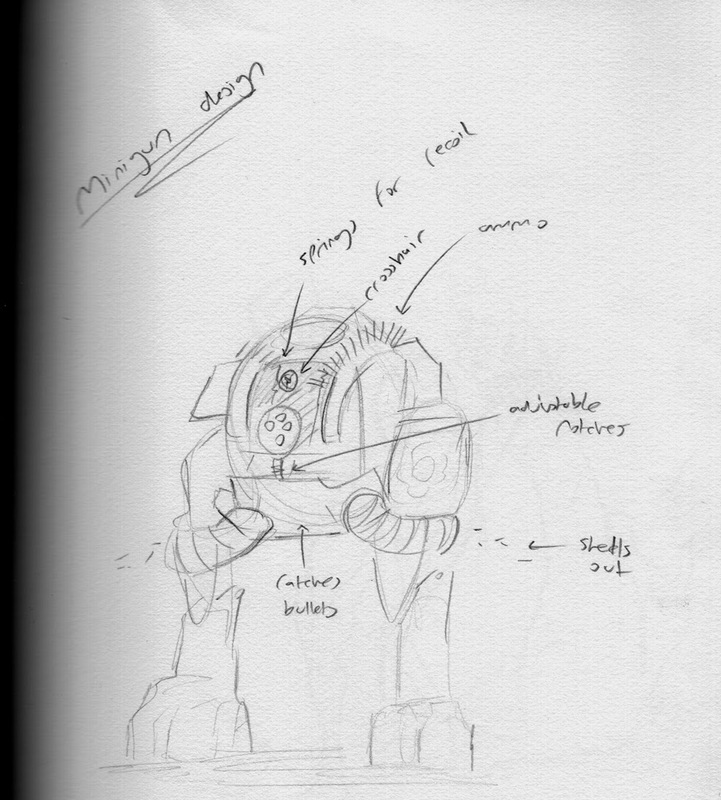 I believe it almost gave me a feel for the forms, and look closely at the small mechanical details of the war weaponry. Also, the ligting conditions where bad for photography, so details would have been lost. One feature we noticed with the mini gun was the way in which it used pipes to efficiently dispose of ammo casings. I also featured a spring loaded stability bar contain springs to dampen recoil. The ammo belt is also dispensed from a duel ammo boxes positioned on either side of the upper body. The machine also runs on a large battery positioned on the rear. Essentially, it is a walking mini gun. 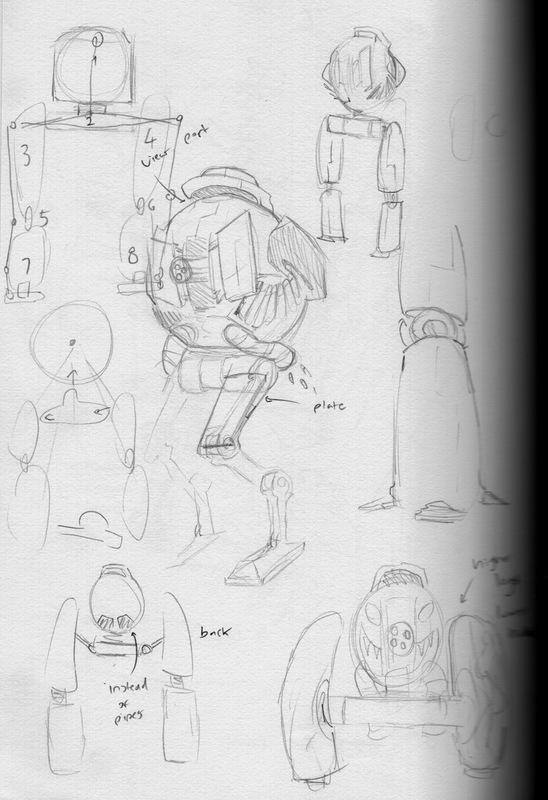 I also made notes on how the Mech might move. I thought the knees could bend with organic piping, eliminating the need for modelling intricate components and grouping them together into a sensical hierarchy. 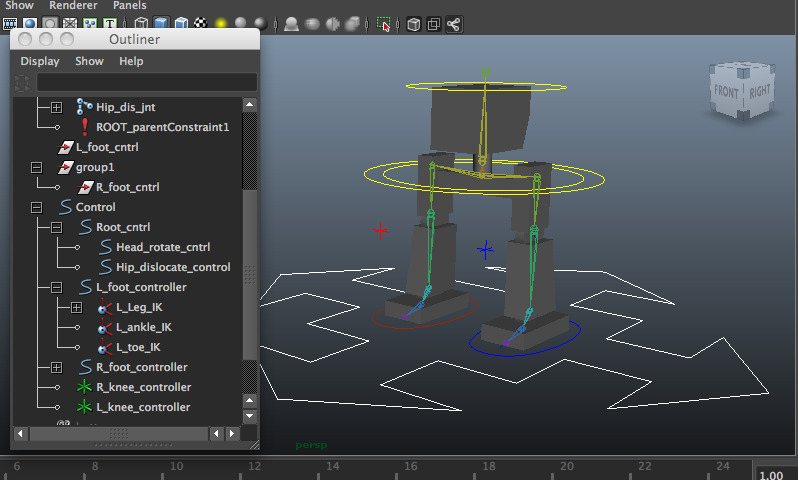 This way we could just bind a singly mesh for the lower body at least. I also thought about how the upper body might rotate independently. 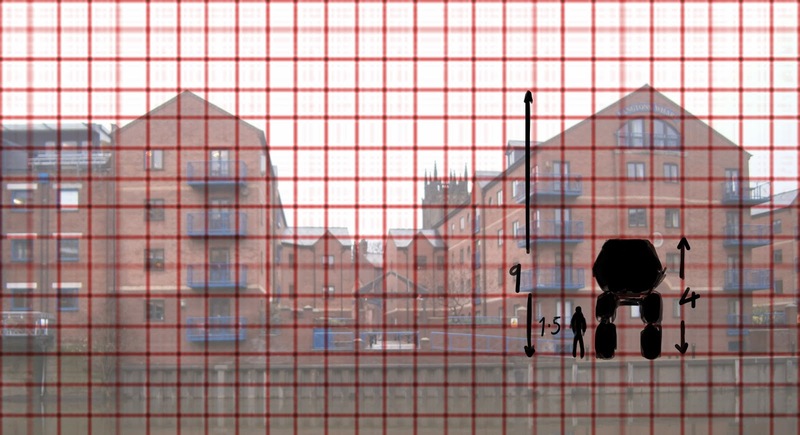 The Mechs are just under the height of three men, and two units across in width.